We have a problem. The King is stupid, lazy, not interested in governing, and is also apparently gay. This presents a serious issue, as a blood-heir is a requirement. And the other problems are tantamount to the regime crumbling into chaos. The King's advisors have taken it onto themselves to solve this problem. 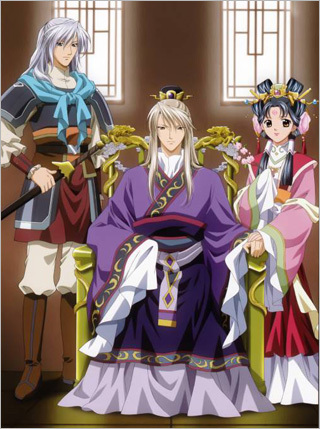 There's a young lady of high-rank whose family has fallen on hard times, and, for the right sum, would agree to become the King's Consort. 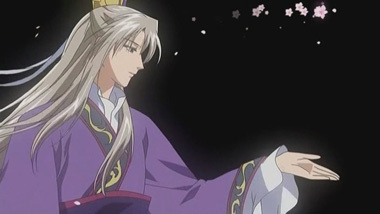 Maybe she can convince him to take an interest in being a ruler, and since she's also quite pretty, convince him to perform other ummm.., "acts" for his kingdom. 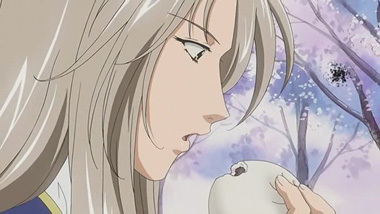 And so sets up The Story of Saiunkoku, a bishonen romantic drama that we expected to be pedantic. Color us surprised. It's wonderful. 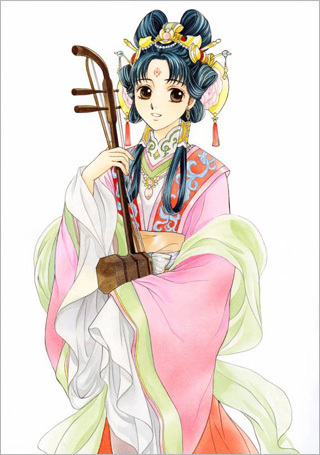 Our protagonist, the Lady Shurei Hong is energetic, observant, sharp, smart, much more schooled and intelligent than you'd expect, and at the same time, diplomatic, patient, humble and giving of herself. 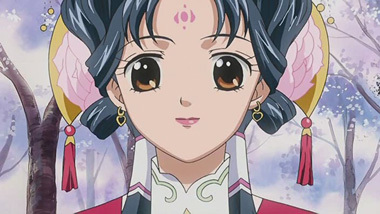 She's easily one the of strongest female role-models we've ever seen in an anime. Ever. 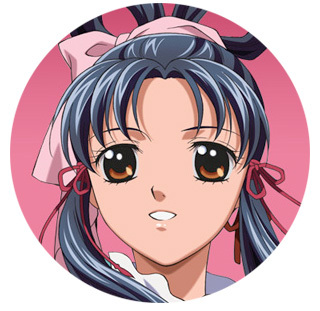 Despite being surrounded by pretty-boys, she's not having nosebleeds, and every single male character underestimates her to their detriment. If she were the King, this country would be ruling the planet. 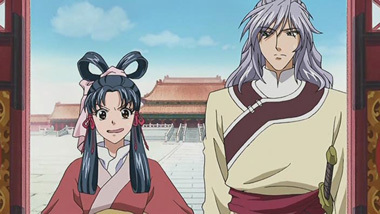 However, this story takes place in a fictional version of a feudal China and/or Japan in the fictional kingdom of Saiunkoku, where women don't carry a lot of weight (officially). That doesn't stop her. She understands her place, but is able to dance around the restrictions with grace, and eventually rise above them. Although the series takes its time and doesn't feel rushed, things do happen rather quickly. And this is where the series really shines, because plot twists and turns come at you with each history lesson about the characters. And as for the King? Well, let's just say that things aren't always what they seem. 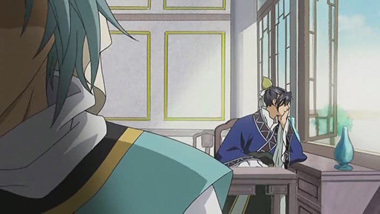 He can be just as surprising sometimes, as Lady Shurei. And then there's the running gag regarding how awful her father's tea is. But it can get complicated at times as all soap-operas do, and there's a large cast to keep track of (there's an entire Wikipedia article devoted to who all the characters and clans are), so be prepared to sit up straight and keep your eyes and ears open. With fortune-cookie episode titles, a gorgeous palette of pastel colors, some solid character designs, and really top-notch writing, this series proves you can have a winner of a anime series without blood-n-guts violence and explosions going off every episode. We're totally impressed. 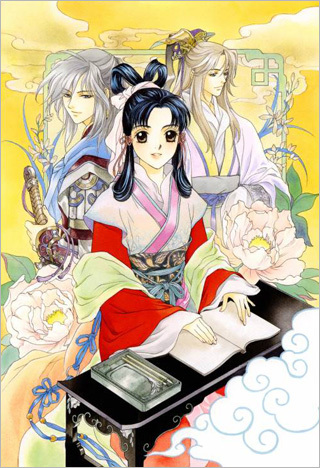 Below: The main characters from Saiunkoku. Below: The Japanese opening titles for Saiunkoku. 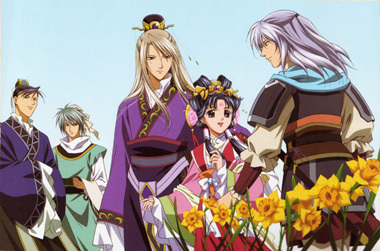 Below: Promotional artwork for Saiunkoku.